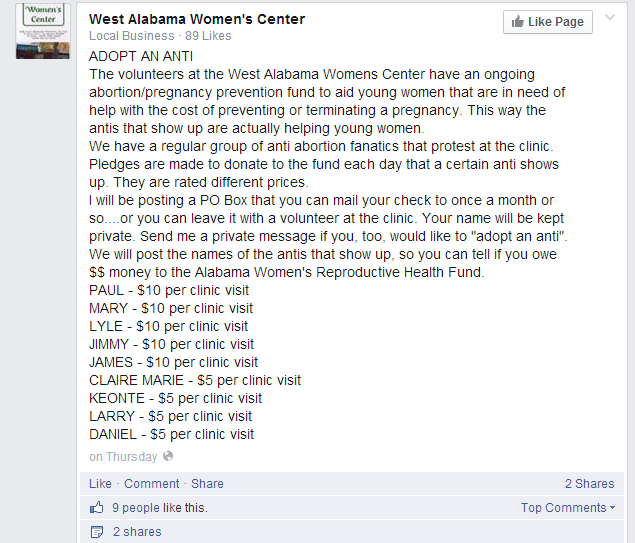 The West Alabama Women’s Center is asking pro-abortion supporters to “adopt” an “anti” by donating a certain amount of money each time pro-life activists show up at the clinic to offer support and information for women facing crisis pregnancies. Among those listed is my friend and fellow Student for Life Wilberforce Fellow, Claire Marie Chretien, who is the president ofBama Students for Life at the University of Alabama and a contributor to Live Action News. Claire is apparently worth $5, which is an obvious and massive undervaluing if you’ve ever seen her in action! Screen shot from The West Alabama Women’s Center Facebook Page. Far from being discouraged by this, members of Bama Students for Life are proud to add this distinction to their already impressive pro-life résumés, which include hosting the Genocide Awareness Project, which has led to repeated attacks on the group in the student paper, The Crimson White. Nothing screams desperate more than an abortion center’s fake fundraising off of Tuscaloosa 40 Days for Life. While we save babies from abortion, the West Alabama Women’s Center is trying to get people to send them checks to fund even more abortions. This certainly isn’t helping their reputation as a greedy business or as “pro-choice,” given that the only choice they’re promoting, while mocking adoption, is abortion. Bama Students for Life is not about to cease our peaceful presence outside the West Alabama Women’s Center just because abortion supporters are uncomfortable with how effective we are. As Claire points out, there is a glaring irony in an abortion clinic using “adoption” as a fundraiser to promote the killing of children who could otherwise be given a better life through a true adoption. As someone who was adopted, I find the use of adoption in this way to be completely disgusting. This clinic is already making money off desperate women who feel they have nowhere else to go, and trying to profit from a perversion of adoption is disrespectful and tasteless. Imagine if groups like the West Alabama Women’s Center actually spent this much time, effort, and money promoting actual adoption! But of course they would never do that, because it would affect their pocketbooks – they can’t profit from real adoption. As Live Action has repeatedly pointed out (here, here, here, and here, just to show a few), abortion is not about offering women choices. It’s about making money – so we really can’t be surprised that this business is seeking to fill its coffers even more.